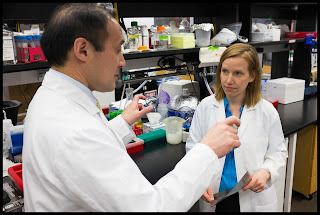 Richard T. Lee, M.D., and Amy Wagers, PhD, Harvard Stem Cell Institute Principal Faculty members, have identified a protein that can restore the enlarged, weakened hearts of aging mice to the size and functional status of the hearts of healthy young mice. Researchers at the Harvard Stem Cell Institute have discovered that the protein GDF-11 have a restoring effect on the aging process of the heart. The GDF-11 protein can restore enlarged, weakened hearts back to its young and healthy status as evidenced in their experiments with hearts of young mice. Age related disease are harder to treat since there is little or no treatment available aside from constant monitoring and regulating the targeted function. One such disease that is age related is diastolic heart failure. Diastolic heart failure is the decline of performance of one or both ventricles of the heart during its relaxed phase (diastole). During diastole, the heart is filled with incoming blood that is being returned from the body through the inferior vena cava (IVC) and superior vena cava (SVC) to the right atrium and from lungs through pulmonary veins to the left atrium. In Diastolic heart failure, the ventricle does not fill properly with blood because of thick and rigid walls or that the ventricle cannot relax. Age is one of the common risk factors for the disease and there is no treatment for this except for therapy targeting the affected ventricle. With the discovery of the effect of GDF-11 to the heart, age-related heart disease such as diastolic heart failure may one day be treated. Two Harvard Stem Cell Institute researchers – one a stem cell biologist and one a practicing cardiologist at Brigham and Women's Hospital – have identified a protein in the blood of mice and humans that may prove to be the first effective treatment for the form of age-related heart failure that affects millions of Americans. Even more important than the implications for the treatment of diastolic heart failure, the finding by Richard T. Lee, a Harvard Medical School professor at BWH, and Amy Wagers, a professor in Harvard's Department of Stem Cell and Regenerative Biology ultimately may rewrite our understanding of aging. A report on Lee and Wagers's findings was published today by the journal Cell. "The most common form of heart failure (in the elderly) is actually a form that's not caused by heart attacks but is very much related to the heart aging," said Lee, who, like Wagers, is an HSCI Principal Faculty member. "In this study we were able to show that a protein that circulates in the blood is related to this aging process, and if we gave older mice this protein, we could reverse the heart aging in a very short period of time," Lee said. "We are very excited about it because it opens a new window on the most common form of heart failure," says Lee, adding, "this is the coolest thing I've ever been a part of." Doug Melton, HSCI co-director and Harvard's Xander University Professor, calls the discovery "huge. It's going to change the way we think about aging," he says. I have 300 patients right now and I think I have about 20 who are suffering from this type of heart failure, which we sometimes call diastolic heart failure," says Lee. "They come into the hospital, have a lot of fluid taken off, then they'll go home; then they come back again. It's really frustrating because we don't have any drugs to treat this. We need to work as hard as we can, to figure out if this discovery can be turned into a treatment for heart failure in our aging patients." The Lee and Wagers labs now are focused on moving GDF-11 toward clinical trials – which Lee predicts could begin in four to five years – and learning what other tissue types the protein might affect. Wagers, who has been working with what is called the parabiotic mouse system – in which mice share a circulatory system – since her postdoctoral days at Stanford, has previously shown that factors in the blood of young animals, which until now were unidentified, have a rejuvenating effect upon various tissues in older animals, particularly in the spinal cored and musculature. "As we age there are many changes that occur in different parts of the body," Wagers notes, "and those changes are often associated with a decline in the function of our bodies. One of the interests of my laboratory is in understanding why this happens and whether it is an inevitable consequence of aging, or if it might be reversible. In this study we compared young and old animals and identified a substance in the blood that is present at high levels when you're young, and lower levels when you're old. We further found that when we supplemented the low levels of this substance that were present in old animals to the levels normally seen in youth, this could have a dramatic effect on the heart. "It's been observed for many, many years that when aging occurs it effects multiple body systems sort of in a semi-synchronous way," Wagers says, "and this suggests that there may be some common signal that drives the body's response to getting older. We hypothesized that this common signal might be a substance that was traveling in the blood stream, because the blood stream accesses organs throughout the body." "I think Amy and I started thinking about something like this almost five years ago," says Lee, who says that he and Wagers were brought together by HSCI. "Without the Harvard Stem Cell Institute, this never would have happened," he says. The researchers conducted their first experiment about four years ago, and the results were startling, Lee says. "A Fellow named Francesco Loffredo was examining the hearts of the aging mice. He came to me and said 'you don't have to analyze it; you can see it with the naked eye.' I couldn't believe that, and I said 'go back, analyze it, and do it blinded.' Then I looked at the hearts and I could see he was correct," Lee recounts. When we started these experiments, I actually was thinking that there would not be a response," Wagers says. "We had been using similar kinds of approaches in other tissues, regenerative tissues, tissues that we know have the capacity to heal themselves after they've been injured. But the heart is not well known for doing that, and so I was quite convinced that there would be no response. When I saw the dramatic difference in heart size that was very apparent after this exposure of an old animal to young blood, it was very clear that we had to figure out what was going on," she says. "The blood is full of all kinds of things," the biologist continues, "and trying to narrow down what might be the responsible factor was going to be a big challenge. I think that's where the collaboration was so wonderful in that we could take advantage of the expertise in both of our laboratories to really home in on what might be the responsible substance. As Lee explains, "we thought it was interesting right away, and we repeated it right away. But we had to show that this was not a blood pressure effect, that the young mice didn't just cause the old mice to have lower blood pressure. We had to build a custom device to measure blood pressures off their tails. It took a year to do the analysis to show that it was not a blood pressure effect." He continues: "After about two and a half years we were convinced, and said, 'we really have to identify this factor. It took about six months to find something and another year to be convinced that it was real. We looked at lipids; we looked at metabolites. Then we sent up a collaboration with a startup company in Colorado, called Somalogic, that had an interesting technology for analyzing factors in blood, and by working closely with Somalogic, we found the likely factor." What the researchers found was that at least one of the factors causing the rejuvenation of the hearts was GDF-11, "a member of a very important family of proteins called TGF-beta proteins, for Transforming Growth Factor. There are around 35 members of the family," Lee says, "some have been very well studied, and this is one that is relatively obscure." Over the course of her still early career, Wagers has celebrated the publication of important papers by going skydiving. This coming weekend, she plans to once again take the plunge, this time accompanied by Lee postdoc Francesco Loffredo.